Here are a few of the features of the piece that may not be obvious from watching the videos or photos. The small fish in Boris' hand wiggles actuated by links up through the body and down the arm. It was my goal to have no visible links in this piece. The eyes of each raccoon move side to side. In the end the movement was limited by the internal width of the head. A small mouse rises on a piece of cheese every 24 revolutions of the crank, stays visible for 8 revolutions and then settles again. The tails wag in different directions to add more interest. The garbage can includes a disposed 'Automata for Dummies' manual. An anti-reverse ratchet was added since I have found you can't rely on people notice the direction of turn arrow! The counterweights have steel rods embedded in them for extra weight. There are two additional open supports on the main shaft to prevent any downward deflection of the main shaft. Shafts, cams and followers are all followers are all wax coated to reduce friction. What to Put in a Garbage Can! Selecting items for the garbage can required thinking back to the days before waste recycling. 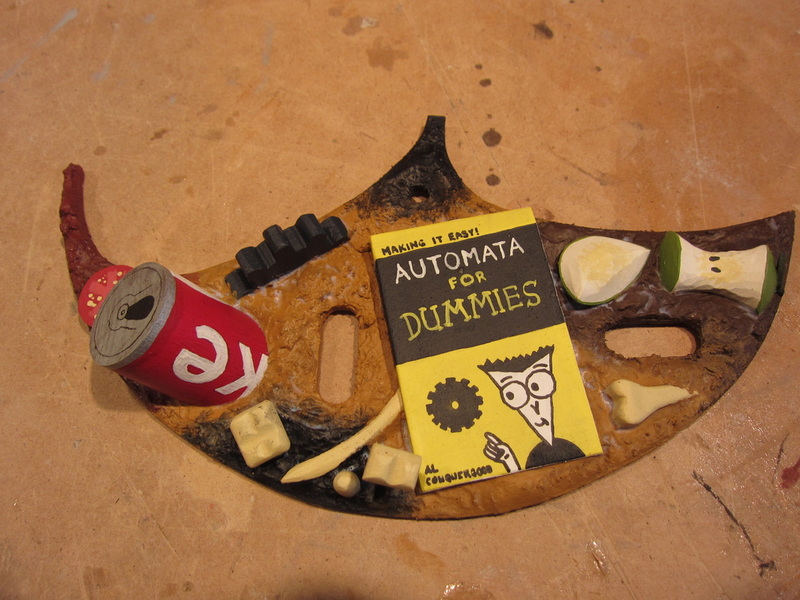 This is the insert for the rear of trash can Beyond the usual food waste the trash includes the quintessential Coke can and a tongue-in-cheek discarded volume of "Automata for Dummies". Perhaps its disposal is premature!